Since I'm living in a monarchy, I definitely want to enjoy the spectacle. My abstract view of monarchy as a system is not uncritically approving, but I feel that switching to anything else at this stage would have many downsides. And there's no question that our current incumbent is a tough old bird for an 86 year old. We aren't having a Jubilee street party in the village where I live - philmophlegm & I had actually planned to be away anyway, and only changed plans at the last minute. 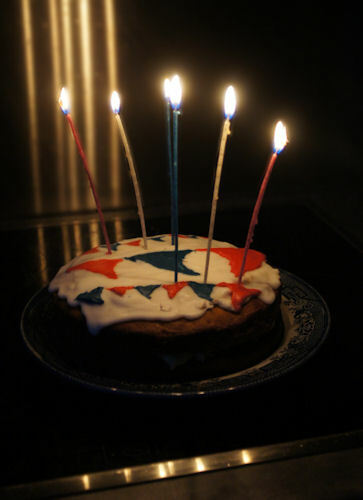 But I felt that as the country was jubilating, some joining-in type gesture should be made, and I so I made a Jubilee cake. It was a ginger and walnut cake. I made it with golden syrup, which made it very light and fluffy. Possibly I should have cut the crystallised ginger up a bit more. The icing was a bit blobby as I didnt' have any drawing icing but just mixed up water icing with a little blue & red colour - and I have no experience in icing art anyway. It seems hard! But I think you can more or less see it was intended to be bunting. And it is delicious, which is of course the main thing. We watched the Thames river pageant on TV today. It was brilliant. So many different shapes and histories of boat! I thought it was a bit unfair of the BBC commentators to say that the 'wow moment' (the flypast of planes and helicopters) wasn't happening at the end because of the rain - what more of a wow do you need than a thousand boats on the Thames? And for heaven's sake, stop moaning about the weather and just get a proper coat and wellies, why don't you, you soft commentating types! It's Britain! It rains! There are details of all the participating boats and ships here. I think some of the TV commentators would have been a lot more interesting if they had just read out details from the PDFs. Or indeed, if they had just stopped wittering on and let us listen to the music. Also, it added an interesting new dimension to 'Rule Britannia' that the poor singers perched on top of their Musical Boat were by that stage absolutely wringing wet with the heavy rain, and therefore looked like they were less ruling the waves than emerging from them as a sort of Merpeople Choir. Blood, water, fruit and corpses up the hold. Still patterned with the vine and grapes in gold. Set the crew laughing, and forgot his course. It was so old a ship—who knows, who knows? And the whole deck put on its leaves again. The BBC had one chap who had been brought in as a boat expert: he was good. They should have dumped most of the rest of them and just have him talk us through the boats, that was the kind of coverage I was hoping for!